Oh, we do love heading to London for a bridal style fix. Even more so this year as White Gallery and London Bridal Week came together for the first time ever! Taking place in London’s ExCel, the three day event is where boutique owners decide which collections to bring in-store for the seasons ahead so it’s a pretty big deal. We’ve rounded up some of the most fabulous things we saw. Prepare for plenty of wedding style inspo! The upcoming Royal wedding was a hot topic among some of our fave bridal designers. From regal blue shoes to crowns fit for a princess, you can give your bridal style the royal seal of approval. Behold the Limited Edition Meghan Markle inspired bridal shoe. Each pair of these shoes has a sixpence created especially for 2018 the year of the Royal wedding in collaboration with the Royal Mint. Pre-order now for delivery expected end of May/start of June. Get in line, ladies! We felt like royalty with the regal blue accessories at Rachel Simpson. Texture was key for the new season, with feathers being the go-to for many of our fave designers. We just love the luxury feel of these gowns. Picture perfect at the Alan Hannah catwalk show. Savin London provided all the feather inspo – check out that texture! Yup, Savin London seriously knows how to use a feather for the most amazing bridalwear. FAB-U-LOUS! Is there anything more spectacular than Eliza Jane Howell’s 1920s vibes? We were obsessed with this feather skirt from Elbeth Gillis. Extra style points for the oh-so-soft knitwear worn over the bridal dress and skirt. We were ready to embrace a new bridal season with beautiful florals taking over the catwalk. Never has a bridal cover up been so stylish. Whether you go all-out sequins or opt for a high end fashion cape, there’s plenty of options for next season. A bridal biker jacket? Yes, please Savin London! Oh Sassi Holford, we love you – and we love your a-mazing jacket! For brides looking for an alternative to white or ivory, the show presented some gorgeous colourful options, from blush pink to eye-catching red. Would you dare to wear? Savin London making us blush with these two fabulous gowns! How could you not fall in love with the blue and grey tones at Le Papillon by Modeca? Who needs the KiraKira sparkle app when you have these gorgeous gowns for your big day? Just the right amount of dazzle. We love the unique use of plenty of sparkle – just look at those stars! Can we just take a minute to appreciate this Cagteks Bridal creation? From bridal trainers to the cutest puffa jacket we’ve ever seen, the designers know how to keep you comfortable on your wedding day! The low heel mules from Harriet Wilde were a particular talking point. From black trims to dramatic noir gowns, we loved the unique take on traditional bridal. Like something out an old Hollywood movie! All hail the mighty pocket! We’re delighted to see this trend continue onto the next season. Cue being able to say ‘look, it has pockets!’ to every guest on your wedding day. How to make a beautiful Elbeth Gillis gown even better? Add pockets, of course! Next season is all about the shoulder, or lack thereof with plenty of gorgeous cut outs and off the shoulder designs on the catwalk. Fancy two big day looks in one? You’re going to love the new season offerings, with plenty of designs which can be totally transformed with the slip of a skirt or addition of an oh-so-stylish belt. Not forgetting the little details which can really make your bridal look. We’ll take them all! These Harriet Wilde beauties mark the designer’s 10th anniversary and come with customisable laces (you get some gorge flower details) and a cute tote bag. Lace us up! 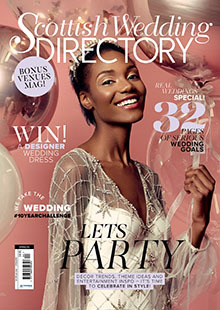 SEE EVEN MORE FROM THE WHITE GALLERY + LONDON BRIDAL WEEK IN OUR SUMMER ISSUE, OUT LATE JUNE! 4 stunning trends for 2018 that’ll make you want to be a Demetrios Bride!